However, please consult the 2018 AUT Postgraduate Handbook for official information on assessment policies and procedures and discuss with your supervisor(s). 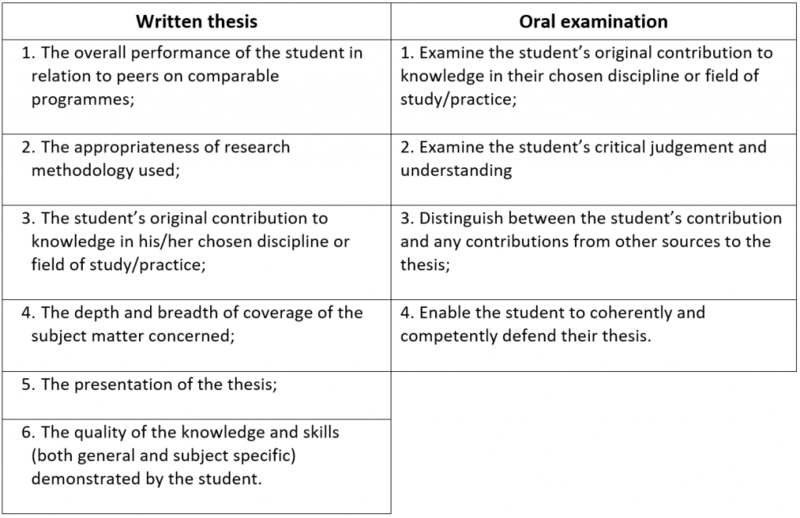 Last week, we looked at the general process for assessing a thesis, and broke down the criteria for grading a Masters or Honours thesis or dissertation. If you’re working towards your doctorate, you can expect the assessment process to take a few months – the doctorate is, after all, the pinnacle of academic achievement, and cannot be awarded lightly. 1. Examiners read your thesis and submit independent reports to the Graduate Research School, each making a provisional recommendation for a particular outcome. As with any thesis or dissertation examination, there is a subjective element to the examiners’ recommendations. 2. Reports are send to members of the AUT Examination Panel, consisting of the examiners, plus an independent convenor who ensures the fairness of the oral examination. The panel considers the reports in relation to the outcomes; if examiners provisionally recommend a pass (outcomes 1-3), then an oral exam is planned. NB. There are often differences between examiners’ recommendations. If there is a major difference of opinion, there may be some negotiation with examiners prior to the exam proceeding. 3. Anonymised reports are normally released to you a week before the oral exam (not showing the provisional recommendations). 4. You sit the oral exam. 6. The University Postgraduate Board considers the recommendation and makes a final decision (accepting the recommendation, if it is unanimous). You can find more details about this process on pages 114-124 of the 2018 Postgraduate Handbook; or check out pages 124-127 if your research is practice-led. You might assume that, for a complex piece of research and a complex assessment process, the assessment criteria would get a little more complicated too. After all, a doctoral thesis is the longest, most challenging piece of writing you can do as a student. On the face of it, though, the assessment criteria seem less prescribed at this high level. There are ten criteria in all – six for the written thesis, and four for the oral exam – and each criterion is under 20 words long. There are just 3 passing outcomes, and they aren’t related to the letter grade system. (For instance, an Outcome 1 thesis is not equivalent to an ‘A,’ and an Outcome 3 thesis is not equivalent to a ‘C.’) The outcomes simply reflect the degree of revision (if any) required. Examiners are asked to consider your performance in relation to other doctoral candidates. Your thesis is expected to be of a comparable standard to others’ doctoral theses. If you have explained and justified your research methodology, showing a good understanding of its relative merits and drawbacks for your particular project, then you are likely to fare well on this criterion. The ‘original contribution to knowledge’ is one of the things that makes a doctorate so prestigious. Masters research is not required to make such a contribution; this is particular to doctoral degrees. The requirement to make an original contribution to knowledge can sound intimidating. However, there are quite a number of ways to meet it. An original contribution isn’t necessarily all about your results and findings; you can also make an original contribution in your creative use of methods, or innovative application of theory. Check out this past Thesislink post for ideas about how to make an original contribution. This criterion allows examiners quite a lot of scope to comment on your engagement with the literature in your field (and related fields), as well as your discussion of your own research. The key takeaway from this criterion is that both depth and breadth are important in a successful doctoral thesis. You need to balance your immersion in your specific research niche, with your awareness of other work in related areas. Examiners may comment on big-picture presentation issues like your thesis structure and quality of writing; they may even comment on specifics like your spelling, grammar, and formatting. This criterion allows them to consider elements of style, so of course, it’s important that you do too. At the oral examination, your examiners will consider the contribution you have made through your research and your thesis, and they make ask questions about where you think the originality lies in your work. As a potential doctor, examiners will expect your critical faculties to be sharp. How well do you understand your own research and its context? How advanced, nuanced, and sophisticated is your perspective? Examiners will consider the degree to which your thesis can be considered your work. This is particularly relevant if you have chosen Pathway 2 (thesis by publication), because any co-authors on your publications will be part-authors of the material included in your thesis. Examiners are required to assess how ‘coherently and competently’ you defend your thesis. Note that ‘defend’ is different to ‘discuss.’ You must justify your decisions: why did you make the choices that you made about your subject, scope, methods, research process, literature, thesis structure? Examiners will be looking for you to defend those choices convincingly. 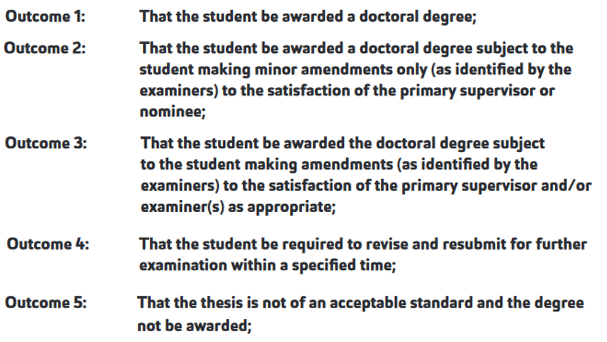 If you get Outcome 5 (which is very rare) you will not be awarded a doctorate, but you may be recommended to receive an MPhil instead. If you get Outcome 4, you’ll have to substantially revise and resubmit to go through the examination process again. If you get Outcomes 2 or 3, you’ll have some amendments to make before you can deposit your thesis and graduate. And if you get Outcome 1, you’re done! Congratulations!